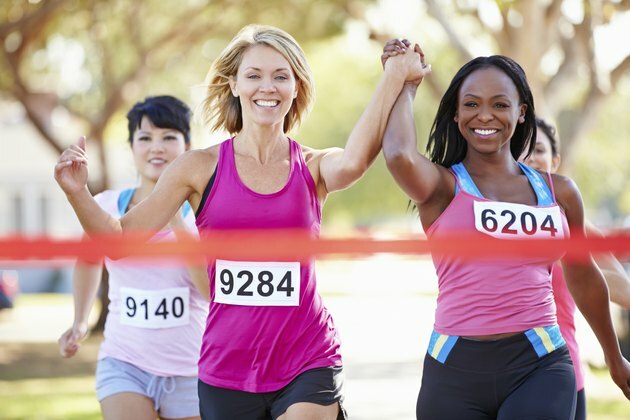 The half-marathon is 13.1 miles and is typically accompanied by a specific training program. Runners may use a program that calls for four to six workouts per week, but there are times when you can only run three days per week. Running only three days per week has several benefits, including preventing injuries and overtraining, along with providing extra time for strength training workouts or recreational sports. Even though your schedule limits your training to three days per week, you can still cross the finish line of your next half-marathon. By training only three days per week, the entire length of the half-marathon training program should last at least 12 to 16 weeks. This extended time frame allows enough time for your body to adapt and prepares your body for the physical challenges of the race. Each week will gradually progress in intensity to prepare your mind and body for race day, but will also develop a pattern for a lifetime of healthy running. Intensity is the primary factor in a three-day training program. Each workout during the week has a specific focus and goal in mind, ranging from a speed workout, tempo run and long run. The speed workout incorporates short, high-intensity intervals such as 400 or 800 meter runs while the tempo run focuses on your goal pace in a three to five-mile run. The long run concludes the week and covers about eight to 12 miles. The first two to three weeks of the half-marathon training program are designed to build a foundation for the rest of the program. Each workout progresses in intensity and total mileage. For example, the first few weeks may include a total of about 20 miles with each week adding two to three miles until peaking at about 30 miles per week. The program peaks two to three weeks before race day and then begins to taper down so you are fully recovered for the race. Adding one to two days of strength training can supplement your running workouts for improved performance and overall fitness. You can mix the strength training workouts into the running workouts or supplement the workouts on alternating days. Use functional exercises that incorporate multiple muscle groups such as squats, deadlifts and lunges for the lower body and pullups, pushups and presses for the upper body. Are Protein Shakes Good for You After Running? Can You Lift Weights & Train for a Marathon?